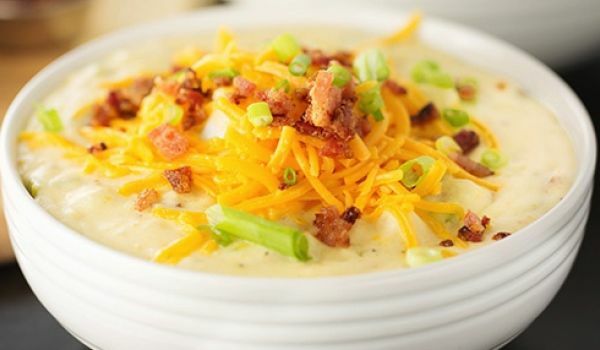 A world apart from the simple-transparent-flavored-broth of most soups, the delectable combination of the potato and cheddar cheese, bettered by the inclusion of bacon, assures a delicious start to any meal. Cook the bacon in a large saucepan, over moderate heat until crisp. Remove the bacon with a slotted spoon and drain on paper towels. Pour off all but 2 tablespoons of the bacon fat. Reduce the heat to moderately low. Add onion and cook, stirring occasionally, until translucent, or for about 5 minutes. Stir in potatoes, water, and salt and bring to a boil. Reduce the heat and simmer covered, stirring occasionally, until the potatoes are tender, i.e. for about 15 to 20 minutes. Remove half the soup from the pan and puree it in a food processor. Return the puree to the pan. Over low heat, add the cheese and stir until melted. Remove the pan from the heat. Taste the soup and add more salt if needed. Serve the soup topped with the bacon and chives.